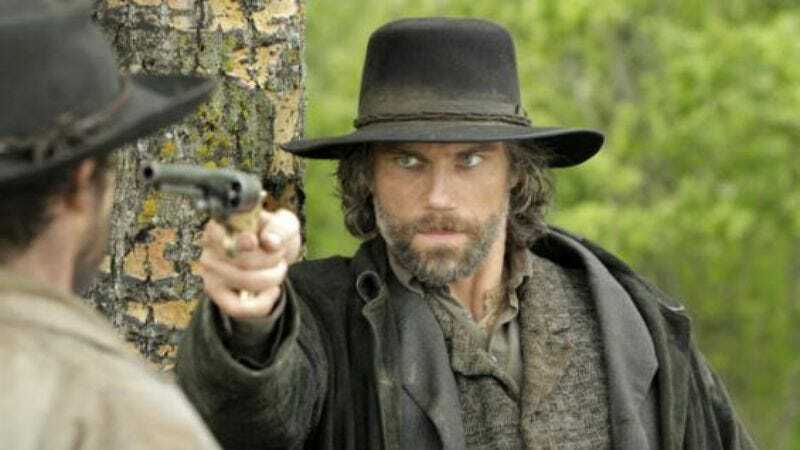 Suggesting that all those TV executives rushing to revive the small-screen Western might be onto something, AMC pulled in big numbers for last night’s première of Hell On Wheels, with 4.4 million Crossroads fans tuning in to see if Teen Choice Award For Best Chemistry winner Anson Mount could create the same sparks with Common that he did with Britney Spears. The critics may remain divided on that—forever—but for the moment America was intrigued enough to make last night’s broadcast AMC’s second-highest debut ever behind The Walking Dead, whose lead-in almost definitely helped. Of course, Hell On Wheels still has to maintain an audience for a full season, and past hit debuts for the network like The Killing and Rubicon saw significant drop-offs in subsequent weeks—and in the case of Rubicon, ended up getting canceled by the end of its first season. But hey, all that’s the past, and as Hell On Wheels has already explicitly reminded us, we need to let go of that.